Are you interested in photography and digital storytelling? Want to hangout with professional photographers and get access to hi-tec digital labs? Flashpoint Labs in partnership with the National Centre of Indigenous Excellence(NCIE), Powerhouse Museum, Vibewire, and Future Journeys is running a changemaking photography and digital storytelling program for young Aboriginal and Torres Strait Islanders (16-24) in inner-city Sydney over the Easter holiday period (April 13th-29th). The BIG PICTURE program focuses on creating an opportunity for local Aboriginal and Torres Strait Islanders to learn and practice photography, storytelling and multimedia production. It’s also about having a chance to hangout with professional photographers, having a bit of hands on creative fun, and getting to access to the Powerhouse Museum’s Hi-Tec Labs. If the participants want, we’ll also have exhibitions in galleries and spaces around Sydney. There will be an introductory afternoon session on Friday 13th April, then six full-day workshops, four at the NCIE on 16th, 17th, 18th, 20th April and two on the weekend of the 28th-29th April, at the Powerhouse’s Thinkspace labs. More details here. APPLY NOW for these FREE workshops! Click here for more information and to fill out the online form, or print out and return the attached flyer to the National Centre of Indigenous Excellence. 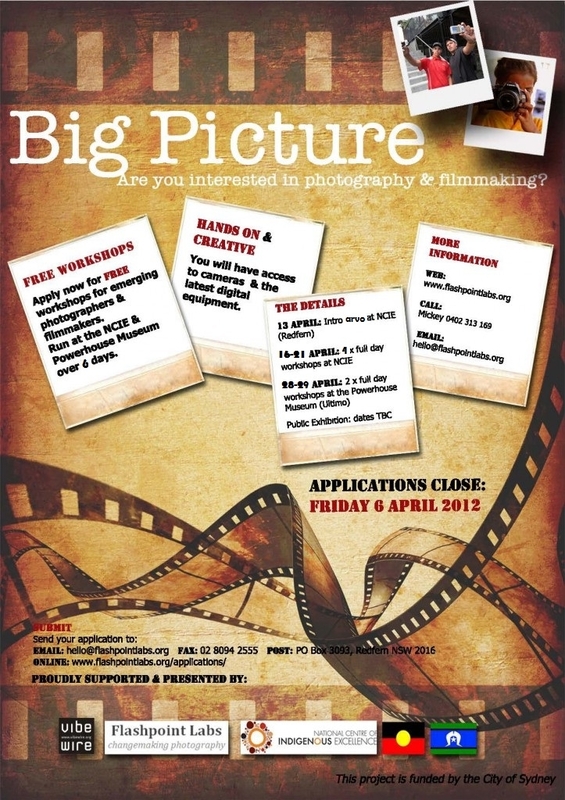 Applications close on Friday April 6th 2012. Priority will be given to students whose applications are received by the deadline. Flashpoint Labs is committed to providing on-going spaces for learning and support for participants of the program. For more information contact Mickey Kovari (Co-founder or Flashpoint Labs and Online Engagement Coordinator at the National Centre of Indigenous Excellence) at hello@flahspointlabs.org or on 8094 2507 during business hours.